P. J. Hughes, an associate professor in Samford University’s McWhorter School of Pharmacy, has a strong belief in the importance of continuous education and professional development. As the director of the school’s continuing professional development program, he aspires to better understand the “insides and outs” of teaching and education based on evidence and research. In August 2016, he enrolled in Samford’s Master of Science in Education, Instructional Design and Technology program in Orlean Beeson School of Education. The Instructional Design and Technology program is designed for students interested in leading the process by which curriculum and training are developed, implemented and evaluated, with a special focus on delivering coursework and training in a variety of environments including blended and online classroom formats. According to Hughes, the pharmacy school was undergoing its national accreditation visit and a schoolwide evaluation around the same time he started his master’s program. The evaluation consisted of numerous surveys and a wide collection of data. As leadership in the pharmacy school worked through the results, they found a common theme from the analysis: Faculty had a desire for development opportunities as it pertains to their roles as educators. Hughes began speaking with fellow faculty members and noticed that his peers were asking similar questions to the topics being addressed in his graduate courses: How can we get things online and share them effectively? How can we take the classroom back and steer away from lecturing and do more active learning strategies? With a vision of a potential partnership in mind, Hughes reached out to leadership in the education school and simultaneously applied for his current position as director of continuing professional development. Hughes approached the education school with an intent to develop a partnership that would address the results of the analysis and help pharmacy faculty and staff further develop their skills as educators. A team consisting of representatives from the education and pharmacy schools met to dissect data and discovered four underlying themes from submissions. 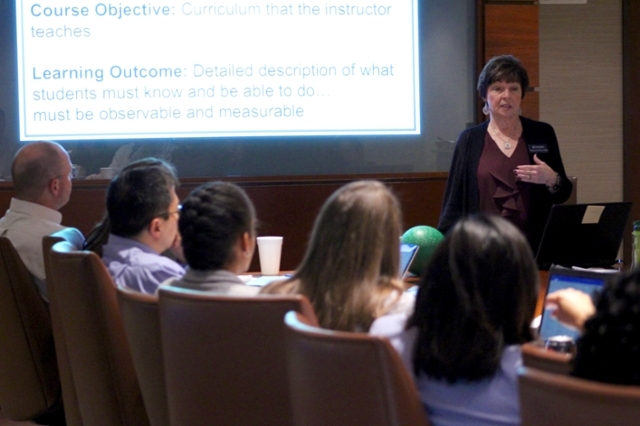 The themes were developed into a four-part Formal Faculty Development Series for the pharmacy school. The team of representatives identified members of the education school considered to be experts in one or more of the topics. Professor Charlotte Freeman would present a formal faculty development lesson on psychology, associate professor Patti Wood would present on two topics (one on lesson plan development and another on assessment) and an instructor from within the Instructional Design and Technology program would present on the use of technology in teaching. Freeman and Wood presented sessions in the fall 2017 and the last topic will be addressed this spring along with Wood’s second session. Hughes’ goal was to have all sessions within one fiscal year. Faculty within the education school are thankful that Hughes recognized the opportunity and sought the expertise of the education faculty. The school sees the partnership as an opportunity to work with multiple schools across campus. As for next steps, Hughes has assessed participating faculty after each seminar and compiled a list of additional professional development needs. Support and guidance while implementing the initial four themes has been a frequent request, according to Hughes, but a new opportunity has also emerged. In spring of 2018, assistant professor Peggy Connell and professor Les Ennis from the education school will present on the scholarship of teaching and learning, “diving into the next level collaborative research,” according to Hughes. “We want to encourage collaboration when it comes to publishing projects that are associated with teaching and learning,” said Hughes. In fact, education professor David Finn and pharmacy professor Mary Worthington are already collaborating on the effects of pediatric drugs and how best to educate school clinicians on what to expect from children taking these medications.